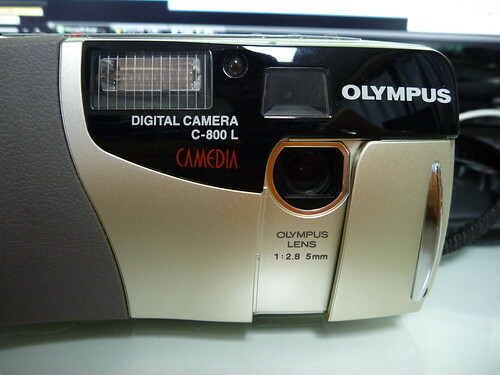 The C-800L (or D-300L in some markets) was introduced by Olympus in 1996 as the inaugural model in their Camedia series of consumer-oriented digital cameras. Its 1024×768 (XGA) resolution was innovative for the time. Other specifications were basic: the non-zooming 5 mm f/2.8 lens gives a 35mm equivalent coverage of 36 mm. Six megabytes of internal flash memory can store a maximum of 30 images in "high quality" mode. Contrast-detection autofocus permist shooting from 0.5 m (1.6 feet) to infinity. A supplementary macro setting is used to permit close focus, down to 0.2 m (0.65 feet). A 1.8" diagonal LCD viewing screen offers a resolution 61,000 pixels (roughly 285×214). ↑ Specifications per owner's manual linked below, page 53. This page was last edited on 15 December 2017, at 06:16.